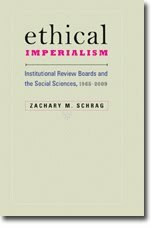 The first article in the Professional Geographer special issue argues that the IRB system assumes that the researcher is a "powerful, knowing agent who assembles a scientific methodology that is always of potential harm to the researched," while subjects are always "less knowing" and vulnerable. As a result, scholars "face the presumption of guilt while seeking to prove innocence in the IRB process of application, negotiation, and usually, but not painlessly, final approval to conduct research." A scholar "wanted to interview people about their participation in a public process of reconciliation many years after a violent racialized confrontation in their community." The people had all already testified publicly about the event, and some were elected officials. Yet the IRB required the scholar to meet with the university counsel who asked to review all manuscripts "to ensure that the research wasn’t going to put anyone in jeopardy. It was apparent at this point that 'anyone.' referred primarily to the university." The authors note that "the scholar was treated in tone and substance not as a peer but as a wayward underling (e.g., the lawyer repeatedly referred to the project as a dissertation, despite the scholar’s status as a member of the faculty)." The scholar himself reported, "I was now at the mercy of the university and its bureaucracy to the point that I thought my whole research agenda was in jeopardy and that my short and altogether brief academic career might be coming to an abrupt end." "A scholar seeking to teach her graduate students about qualitative methods was required by her university’s IRB to submit a protocol for approval, even though the 'research' was pilot studies simulating a research process." When the instructor complained, the IRB chair "explained that it was institutional policy to review classroom activities, primarily because of a concern about loss of funding if any research was not reviewed." Eventually, the scholar acquiesed and used the experience as "a 'teachable moment' about the overreaching of IRBs. "An IRB member who was disturbed by a research topic about terrorism contacted the student-researcher individually to discuss the research," even though the project had been approved. The authors argue that "The concern of the individual IRB member might in fact have been important, well-founded, and legitimate, but for a student to be asked to meet with a faculty person to justify his or her research beyond the requirements of the IRB seems to be an abuse of power," since such an encounter would easily be intimidating. Martin and Inwood credit the willingness of the IRB to meet face-to-face for a good outcome: "The student and her advisors had not considered the possibility and greatly appreciated the concern of the IRB and the willingness to engage openly with the student about how to make the research method work so that the research could proceed and be safe for everyone involved." On the whole, however, Martin and Inwood warn that IRB review can be "highly patriarchal and demeaning to researchers," as well as to "those who were choosing to take part in this research project." Though they do not offer specific policy prescriptions, their essay makes a good case for paying attention to the power dynamics in the IRB process.